The Sacramento TMA is an independent non-profit organization that offers alternatives to driving alone. This website has information on options, incentives to try them, and programs to support your choice to change the way you get to work. 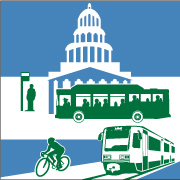 We encourage you to explore this site for information to help you decide which transportation alternatives will work for you. Check out our Facebook page where we post current, interesting commuter facts: how to winterize your bicycle, stay warm waiting for transit, share the street with pedestrians and bicycles (when we're driving). People’s lifestyles vary, and commute needs change based on where we live, distance from work, weather, and personal responsibilities. There are plenty of transportation alternatives: carpooling, vanpooling, riding a bike, taking the bus, telecommuting and walking nn. By considering your options ahead of time, you can be prepared and know what to use when you need one. You can find all the information you need on this site or by calling us at (916) 737-1513. To plan a bicycle trip, go to an online mapping program and click on the bicycle to find the best route. Check out the Transit Providers to find one in your area. An online map program will help find routes and times for Regional Transit, Roseville Transit or Yolo Bus services. Check out the Seats Available in vanpools, or find out how to start your own here.